A lost masterpiece has just resurfaced in Austria, and Lisa Steiner, the artist in charge of restoring it, won't talk to anyone in the media except you. But when you arrive to interview her, Lisa runs away without explanation. Now you must decipher the secret clues hidden in her paintings to track her down and get your story. Lisa's life and yours may depend on it. Dive into a gorgeous, artistic world as you uncover the truth. 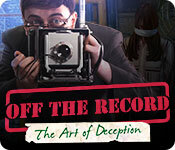 Just be careful deception is a deadly art in this thrilling Hidden Object Puzzle Adventure game!